One of the most prominent things that you will notice in cPanel & WHM v54’s end user interface is the addition of the new Sidebar. With v54, we’ve broken up and reorganized the interface into major areas. The Sidebar is available on every page and surfaces the new and exciting features we’ve been adding from around the product. These are not the applications that you’ll find in the “Sea of Icons” home screen you’re familiar with. Instead, the links found in the Sidebar will take you to higher-level management features or navigation features. First on the list is the “Menu” interface where you will find the familiar ‘sea of icons’ with all of the apps that you’re familiar with. It lists every app available in your cPanel account in the groups you’re familiar with and provides easy ways to search, reorder and collapse/expand apps and groups. Next, you’ll find the ‘Notifications’ link which takes you to a page reserved for alerts and warnings from your system as well as messages that your hosting provider or reseller can keep up to date. This link also sports a badge which will indicate how many messages are waiting for you before you even click it. We foresee this section growing into a messaging platform for your hosting provider, your reseller or your system to communicate with you about goings-on. Look for future development in the space in releases to come. Third on the list is the Statistics page where you’ll find information about your account like general information, accounts and domains, and database and email quotas. This is your one-stop-shop to assess how you’re using your account and when to request an upgrade from your hosting provider. Finally, the new ‘Dashboard’ finishes off the Sidebar with at-a-glance information, quick access to commonly used features and handy settings toggles. We are starting small when it comes to the Dashboard. 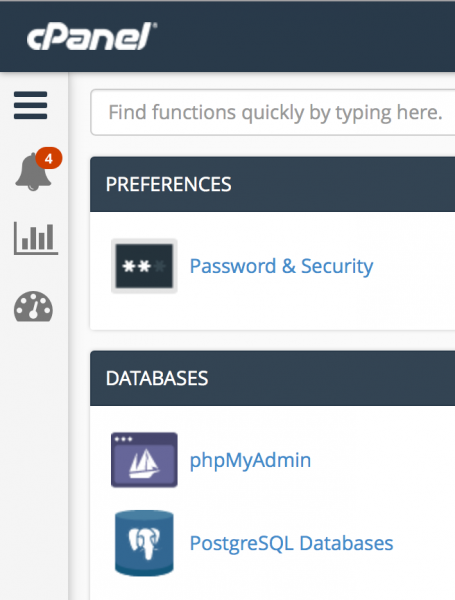 At it’s most basic, the Dashboard is a simplified view into a cPanel account appropriate for end-users who are first starting out. In future releases, we plan on developing even more standard Dashboard widgets for your account as well as releasing a Widget SDK so that hosting providers can create stuff for this page as well. It’s a very different interface in v54 and we look forward to continuing to update and modernize your experience!